alaTest has collected and analyzed 20 reviews of Toshiba Excite Write. The average rating for this product is 3.6/5, compared to an average rating of 4.5/5 for other products in the same category for all reviews. Reviewers are impressed by the size and usability. The storage and performance are also appreciated. There are some less positive opinions about the price and durability, while comments are divided on the design. We analyzed user and expert ratings, product age and more factors. Compared to other products in the same category the Toshiba Excite Write is awarded an overall alaScore™ of 87/100 = Very good quality. 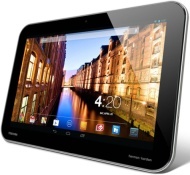 Toshiba Excite Write is a 10.1-inch tablet with 2560x1600 pixels touchscreen, super-fast NVIDIA Tegra 4 processor, 2GB of RAM, 32GB of internal memory, 8-megapixel camera, while Android 4.2 Jelly Bean is running the show. It also comes with a stylus.